A Gold Line train at Downtown Azusa Station. Photo by Steve Hymon/Metro. 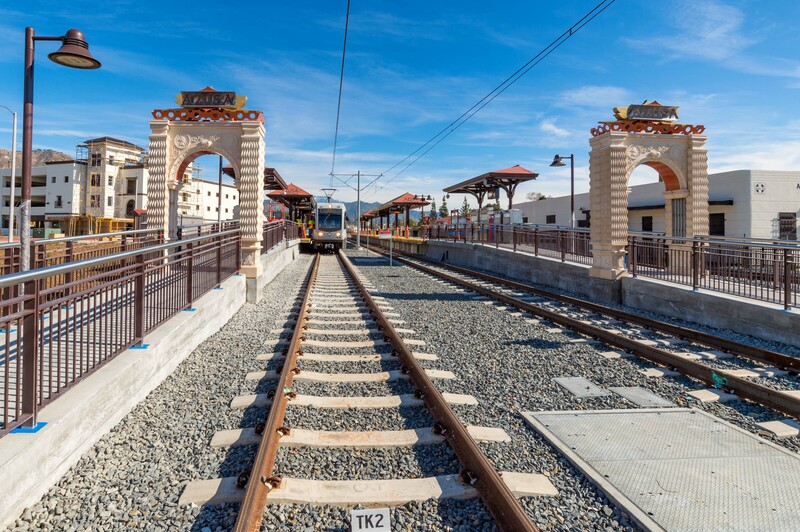 For those planning to ride the Gold Line Sunday, Dec. 4, please note there will be no train service between APU/Citrus College and Azusa Downtown Station from 7:15 a.m. to 12 noon. The Office of Emergency and Homeland Security Preparedness and LASD will be conducting a security exercise for the first responders who keep our system safe. This means all northbound trains travel as far as Azusa Downtown and turn back towards Los Angeles. All southbound trains will start service at Azusa. Bus shuttles will be available for customers traveling between Azusa Downtown and APU/Citrus College. Gold Line trains will arrive approximately every 12 minutes throughout the day and buses will match the schedule as best as possible. The last complete northbound trip departs Atlantic Station at approximately: 5:04, 5:24 & 5:44 a.m. The last complete southbound trip departs APU/Citrus College Station at approximately: 6:48, 7 & 7:12 a.m. These changes can also be found on our Planned Service Advisory page. Thank you to everyone for your patience and understanding. For more transit news and up-to-the-minute service updates, follow us on Twitter @metrolosangeles or @metrolaalerts.